Utilizing some beginning Spanish worksheets is a very practical idea if you intend to teach a class how to speak Spanish. Remember though, that not everyone begins at the same age. Therefore, worksheets and activities will have to be planned accordingly. Although beginners are all beginners, remember that learning the fundamentals in one language aids in learning another. Therefore, preschool students are not going to have the tools to participate in the same types of activities as adult learners would enjoy. Beginning students can be of virtually any age. Once a child learns how to communicate, he or she is capable of learning another language. However, separating the content that is appropriate for younger vs. older students can be difficult, since they are all at a beginner's levels. Here's some helpful tips for determing how to address these diverse groups. Focus on the strengths of the group of students. If they are first graders, they will probably be learning concepts such as numbers in their regular classes. Ask the teacher when they have completed basic numbers, and then teach them in Spanish a bit after. You do not want to confuse the students by teaching both English and Spanish words for numbers at the same time, but you can build off of their existing knowledge base. Do not insult older students. They might feel as though you are looking down on them if you ask them to do certain activities. There is nothing wrong with coloring; however, if you consistently hand out coloring worksheets to a group of college students trying to learn Spanish, they are not going to be very engaged. Watch the expectations that you have of the classes. Do not necessarily expect older students to learn faster, and younger students to learn slower. That may frequently be the case, but do not go into the classroom with those kinds of assumptions. You will have to tailor your lessons to fit the specific group of students that you are working with. Remember that no matter how old the students are, they are going to need to start with some basics. That does mean they should engage in childish activities. However, they too need to learn their numbers, basic vocabulary, alphabet, and time words before they can advance to anything else. 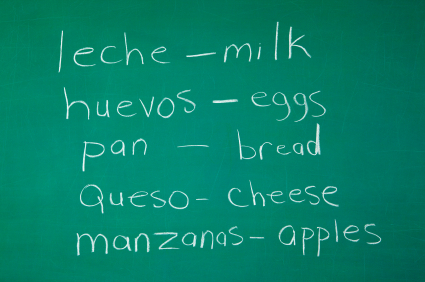 As with any other language, when teaching Spanish you must remember that it is a language. A language can not be fully taught by merely handing some worksheets out to the students. The most important part of teaching a language is encouraging the students to participate in conversations. Setting up role playing scenarios or having students perform conversations in Spanish in front of the class are both extremely effective. Worksheets must act as supplements in a language class, not as the primary method of teaching. "Beginning Spanish Worksheets." YourDictionary, n.d. Web. 19 April 2019. <https://spanish.yourdictionary.com/Spanish-language/learning-spanish/beginning-spanish-worksheets.html>.